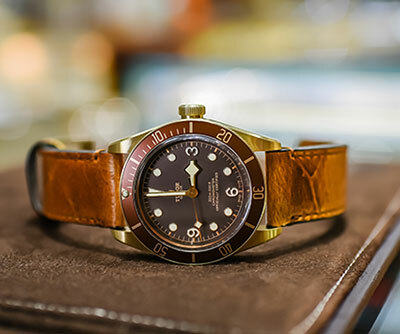 For those of you who tick to the sound of manufacture movements and gaze endlessly at the meticulous brush strokes that grace the finish of a Swiss watch case, then you will be in awe when you catch a glimpse of the latest model to leave the hands of Tudor’s master watch makers… Say hello to the new Heritage Black Bay - Bronze! Within a stunning bronze case beats a mechanical movement, crafted completely in-house and paying homage to its historic heritage of being the king of rugged dive watches. Fitted with a large crown, signature snowflake angular hands, subtle characteristics of the timepieces were inspired from the brands immense history of equipping the worlds best Navy’s with the world’s best timepieces. 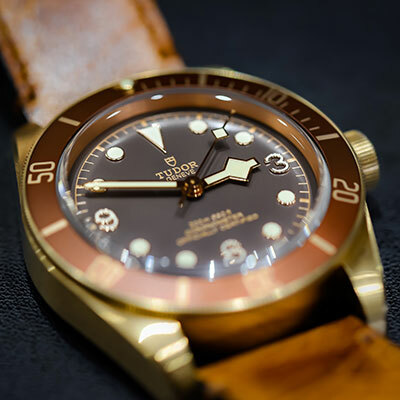 Trust me, once your eyes catch the “distressed” look of the aged leather strap accompanied by the satin bronze buckle, you’ll see why the Black Bay Bronze is said to be one of 2016’s hottest releases. Oh, did I mention that it also has a 70-hour power reserve? Meaning the wearer can take the timepiece off on a Friday night, place it back on Monday morning and not have to wind the watch at all. Thanks to our longstanding relationship with our partners at Tudor, J.R. Dunn Jewelers is one of the only authorized retailers to have ONE of this year's most exclusive timepieces in stock… RIGHT NOW! Stop by our showroom or give us a call for more information.